The year 2004 sees an unusually large number of anniversaries of major advances in mathematics. I began the year with my January column devoted to one of those anniversaries: It is exactly 150 years since the publication in 1854 of George Boole's major work The Laws of Thought. But that merely scratched the surface of this bumper anniversary year. 350 years: In an exchange of five letters in 1654, Pierre De Fermat and Blaise Pascal founded modern probability theory. 250 years: In 1754, Joseph-Louis Lagrange made important discoveries about the tautochrone, which in due course would contribute substantially to the new subject of the calculus of variations. 200 years: In 1804, Wilhelm Bessel published a paper on the orbit of Halley's comet, based on observations by Thomas Harriot 200 years earlier. 150 years: Three major developments took place in 1854. In addition to Boole's publication of The Laws of Thought in England, Arthur Cayley (also in England) made the first attempt to define an abstract group, while in Germany Bernhard Riemann completed his Habilitation. In his dissertation, Riemann studied the representability of functions by trigonometric series and gave the conditions for a function to have an integral (what we now call "Riemann integrability"). In a lecture titled On the hypotheses that lie at the foundations of geometry, given on 10 June 1854, he defined an n-dimensional space and gave a definition of what is today called a "Riemannian space". 100 years: In 1904, Henri Poincare came within a whisker of discovering relativity theory. In an address to the International Congress of Arts and Science in St Louis, he remarked that observers in different frames will have clocks which will "... mark what one may call the local time. ... as demanded by the relativity principle the observer cannot know whether he is at rest or in absolute motion." Unfortunately, he never took the next step - the full Principal of Special Relativity - leaving the field open for Albert Einstein to make that important leap forward and claim the credit the following year. I'll take a look at some of these major advances in future columns. This month, I want to look in depth at the oldest one: the Fermat-Pascal correspondence that established modern probability theory. My account is taken from my book The Language of Mathematics. The first step toward a theory of probability came when a sixteenth century Italian physician - and keen gambler - called Girolamo Cardano described how to give numerical values to the possible outcomes of the roll of dice. He wrote up his observations in a book titled Book on Games of Chance, which he published in 1525. Suppose you roll a die, said Cardano. Assuming the die is "honest", there is an equal chance that it will land with any of the numbers 1 to 6 on top. Thus, the chance that each of the numbers 1 to 6 ends face up is 1 in 6, or 1/6. Today, we use the word "probability" for this numerical value: We say that the probability that the number 5, say, is thrown is 1/6. Going a step further, Cardano reasoned that the probability of throwing either a 1 or a 2 must be 2/6, or 1/3, since the desired outcome is one of two possibilities from a total of six. Going further still - though not quite far enough to make a real scientific breakthrough - Cardano calculated the probabilities of certain outcomes when the die is thrown repeatedly, or when two dice are thrown at once. For instance, what is the probability of throwing, say, a 6 twice in two successive rolls of a die? Cardano reasoned that it must be 1/6 times 1/6, that is, 1/36. You multiply the two probabilities since each of the six possible outcomes on the first roll can occur with each of the six possible outcomes on the second roll, that is, 36 possible combinations in all. Likewise, the probability of throwing, say, a 1 or a 2 twice in two successive rolls is 1/3 times 1/3, namely 1/9. What is the probability that, when two dice are thrown, the two numbers showing face up will add up to, say, 5? Here is how Cardano analyzed that problem. For each die, there are six possible outcomes. So there are 36 (= 6 x 6) possible outcomes when the two dice are thrown: each of the six possible outcomes for one of the two dice can occur with each of the six possible outcomes for the other. How many of these outcomes sum to 5? List them all: 1 and 4, 2 and 3, 3 and 2, 4 and 1. That's four possibilities altogether. So of the 36 possible outcomes, 4 give a sum of 5. So, the probability of a sum of 5 is 4/36, that is, 1/9. Cardano's analysis provided just enough for a prudent gambler to be able to bet wisely on the throw of the dice - or perhaps be wise enough not to play at all. But Cardano stopped just short of the key step that leads to the modern theory of probability. So too did the great Italian physicist Galileo, who rediscovered much of Cardano's analysis early in the seventeenth century, at the request of his patron, the Grand Duke of Tuscany, who wanted to improve his performance at the gambling tables. What stopped both Cardano and Galileo was that they did not look to see if there was a way to use their numbers - their probabilities - to predict the future. That key step was left to the two French mathematicians Blaise Pascal and Pierre de Fermat. In 1654, the two exchanged a series of five letters (the last was dated 27 October) that most people today agree was the beginning of the modern theory of probability. Though their analysis was phrased in terms of one specific problem about gambling, Pascal and Fermat developed a general theory that could be applied in a wide variety of circumstances, to predict the likely outcomes of various courses of events. The problem that Pascal and Fermat examined in their letters had been around for at least two hundred years: How do two gamblers split the pot if their game is interrupted part way through? For instance, suppose the two gamblers are playing a best-out-of-five dice game. In the middle of the game, with one player leading two to one, they have to abandon the game. How should they divide the pot? If the game were tied, there wouldn't be a problem. They could simply split the pot in half. But in the case being examined, the game is not tied. To be fair, they need to divide the pot to reflect the two-to-one advantage that one player has over the other. They somehow have to figure out what would most likely have happened had the game been allowed to continue. In other words, they have to be able to look into the future -- or in this case, a hypothetical future that never came to pass. The problem of the unfinished game seems to have first appeared in the fifteenth century, when it was posed by Luca Paccioli, the monk who taught Leonardo de Vinci mathematics. It was brought to Pascal's attention by Chevalier de Mere, a French nobleman with a taste for both gambling and mathematics. Unable to resolve the puzzle on his own, Pascal asked Fermat - widely regarded as the most powerful mathematical intellect of the time - for his help. In their letters, Pascal and Fermat not only solved the puzzle of the unfinished game, but in so doing they established the foundations of modern probability theory. To arrive at an answer to Pacciola's puzzle, Pascal and Fermat examined all the possible ways the game could have continued, and observed which player won in each case. For instance, in the case of the best-of-five dice game that is stopped after the third round with one player in the lead by two to one, there are four possible ways the game can be completed. Of those four, three are won by the player in the lead after the third round. So the two players should split the pot with 3/4 going to the person in the lead and 1/4 going to the other. Alhough Pascal and Fermat developed the theory of probability collaboratively, through their correspondence - the two men never met - they each approached the problem in different ways. Fermat preferred the algebraic techniques that he used to such devastating effect in number theory. Pascal, on the other hand, looked for geometric order beneath the patterns of chance. 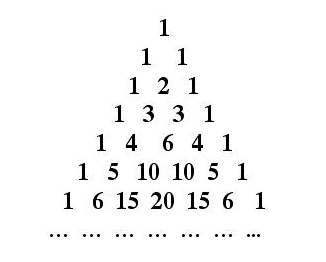 That random events do indeed exhibit geometric patterns is illustrated in dramatic fashion by what is now called Pascal's triangle, shown below. The symmetrical array of numbers shown in the figure is constructed according to the following simple procedure. At the top, start with a 1. On the line beneath, put two 1s. On the line beneath that, put a 1 at each end, and in the middle the sum of the two numbers above and to each side, namely 1 + 1 = 2. On line four, put a 1 at each end, and at each point midway between two adjacent numbers on line three put the sum of those numbers. Thus, in the second place you put 1 + 2 = 3 and in the third place you put 2 + 1 = 3. On line five, put a 1 at each end, and at each point midway between two adjacent numbers on line four put the sum of those numbers. Thus, in the second place you put 1 + 3 = 4, in the third place you put 3 + 3 = 6, and in the fourth place you put 3 + 1 = 4. By continuing in this fashion as far as you want, you generate Pascal's triangle. The patterns of numbers in each row occur frequently in probability computations - Pascal's triangle exhibits a geometric pattern in the world of chance. For example, suppose that when a married couple have a child, there is an equal chance of the baby being male or female. (This is actually not quite accurate, but it's close.) What is the probability that a couple with two children will have two boys? A boy and a girl? Two girls? The answers are, respectively, 1/4, 1/2, and 1/4. Here's why. The first child can be male or female, and likewise the second. So we have the following four possibilities (in order of birth in each case): boy-boy, boy-girl, girl-boy, girl-girl. Each of these four possibilities is equally likely, so there is a 1-in-4 probability that the couple will have two boys, a 2-in-4 (i.e., 1/2) probability of having one of each gender, and a 1-in-4 probability of having two girls. Here is where Pascal's triangle comes in. The third line of the triangle reads 1 2 1. The sum of these three numbers is 4. Dividing each number on the row by the sum 4, we get (in order): 1/4, 2/4 (= 1/2), 1/4, the three probabilities for the different kinds of family. Suppose the couple decide to have three children. What are the probabilities that they have three boys? Two boys and a girl? Two girls and a boy? Three girls? The fourth row of Pascal's triangle gives the answers. The row reads: 1 3 3 1. These numbers sum to 8. The different probabilities are, respectively: 1/8, 3/8, 3/8, 1/8. Similarly, if the couple has four children, the various possible gender combinations have probabilities 1/16, 4/16, 6/16, 4/16, 1/16. Simplifying these fractions, the probabilities read: 1/16, 1/4, 3/8, 1/4, 1/16. In general, whenever there is an event where the individual outcomes can occur with equal probability, Pascal's triangle gives the probabilities of the different possible combinations that can arise when the event is repeated a fixed number of times. If the event is repeated N times, you look at the N+1'st row of the triangle, and the numbers in the row give the numbers of different ways each particular combination can arise. Dividing the row numbers by the sum of the numbers in the row then gives the probabilities. Since Pascal's triangle can be generated by a simple geometric procedure, this method shows that there is geometric structure beneath questions of probability. It's discovery was a magnificent achievement. Last month, I discussed the Archimedes cattle problem, oberving that, in 1981, Harry Nelson solved the problem in ten minutes on a Cray-1 supercomputer. Stan Wagon wrote to point out that algorithms have improved since then. According to Wagon, a good modern laptop can solve the problem in about a second using Mathematica. A section is devoted to this in Wagon and Bressoud's book A Course In Computational Number Theory. Section 7.5 of the book is titled "Archimedes and the Sun God's Cattle". Solving the basic equation (a Pell equation) involved takes 0.01 seconds, but then you have to go through a While loop to get the right solution, and that takes 0.07 seconds. Wagon also notes that some ideas of Ilan Vardi allow an even faster approach that requires almost no computation. Vardi's work is detailed in his paper Archimedes' Cattle Problem, American Mathematical Monthly 105 (1998) 305-319. Devlin's most recent book is The Millennium Problems: The Seven Greatest Unsolved Mathematical Puzzles of Our Time, published by Basic Books (hardback 2002, paperback 2003).